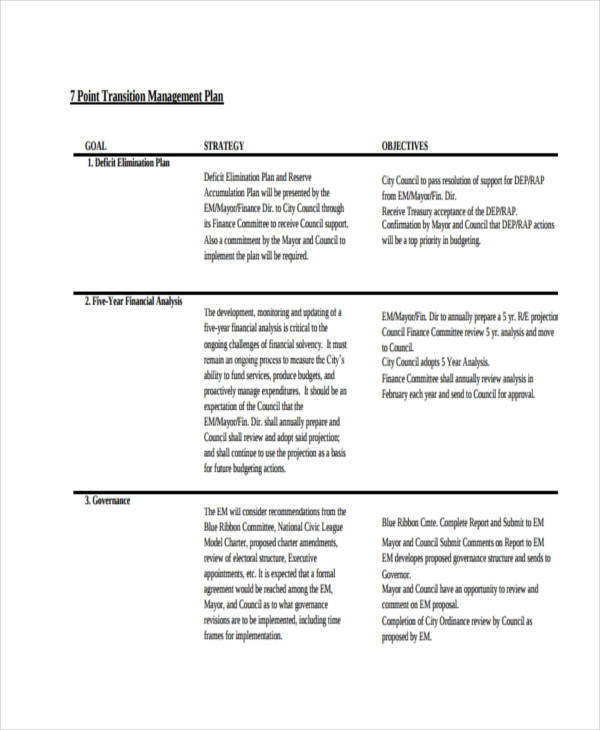 Every marketing plan consists of a transition plan that dictates activities involved from the design phase of the plan to its implementation stage. 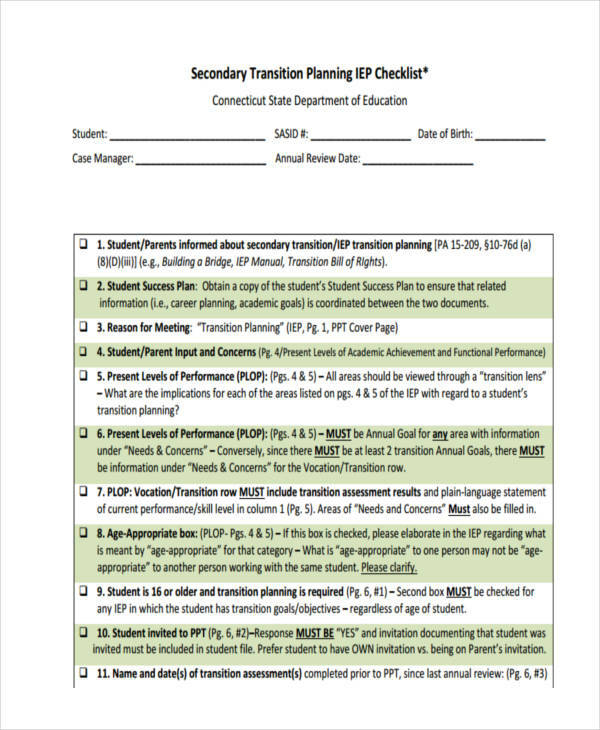 Transition plans simply facilitate or ease the change of pace from one phase to another. 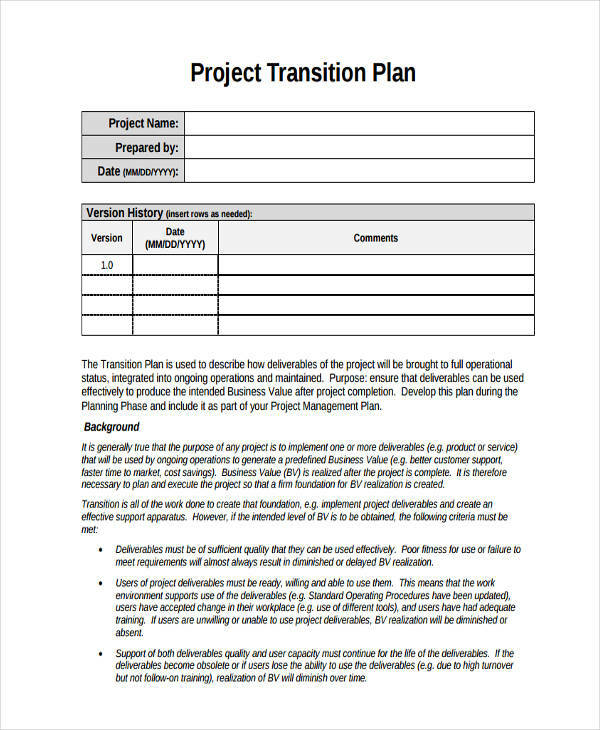 The same is true for transition plans involving business plans. From inception of a business idea to its execution or operation, preparation has to be taken in order to properly layout the activities that need to take place to deliver a business plans development stage onto the production or operation stage of the business. 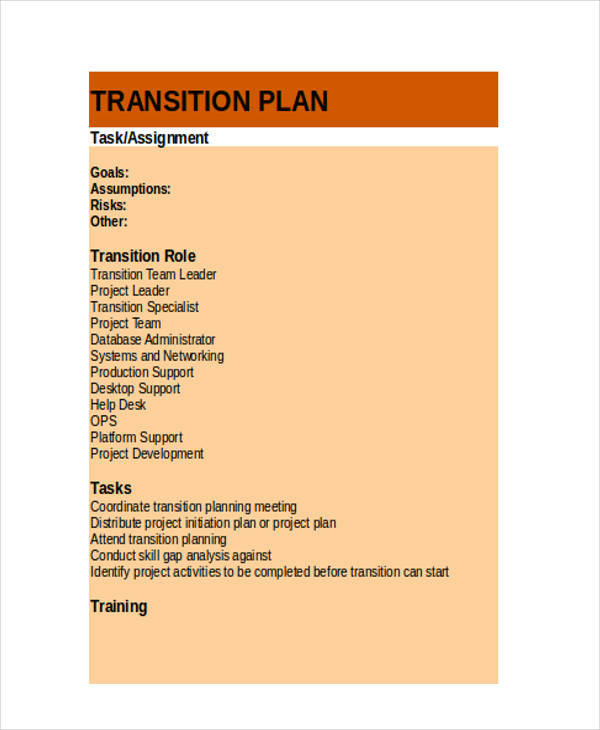 Transition planning, in a way, can be seen as clairvoyance. It is effectively looking forward to what may be and the options available that can be taken to achieve a smooth transition. Decide on where and how the business wants to go forward. 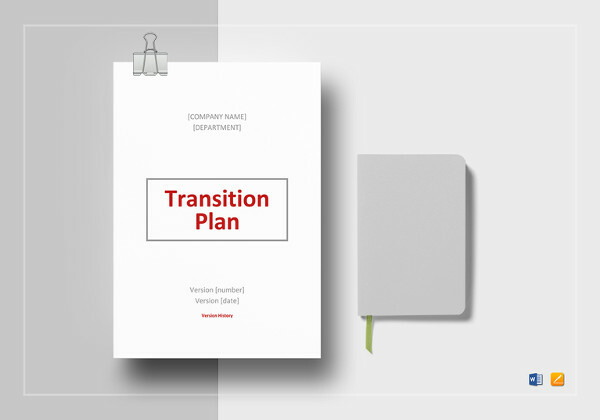 Transition plans often ease the pressure of a transition resulting from a merger of a business or two funds. Draw out any needed processes or actions to improve performance of the business. Some businesses use a brokerage consultant to lower execution costs and help the adviser focus on improving performance. Understand the risks involved during the transition of a business. It is without question that transitions would involve risks not around before the transition. Change is coming and the better the change is understood, the higher the chances of the proper implementation of the changes. Manage the risks during the transition. Having understood the risk factors involved with the transition of the business, these risks can now be handled efficiently and any threats will be addressed accordingly. 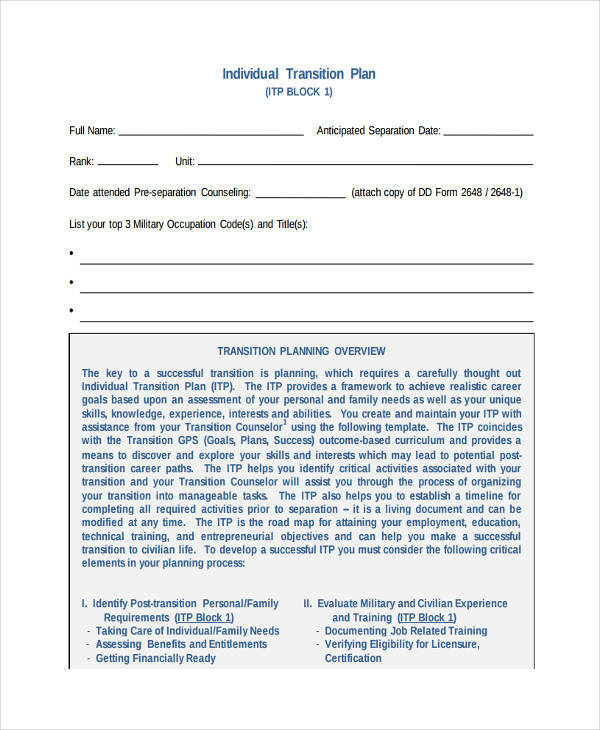 Free business plan examples and business plan examples in PDF format shown in the page contain aspects that describe transition planning further. 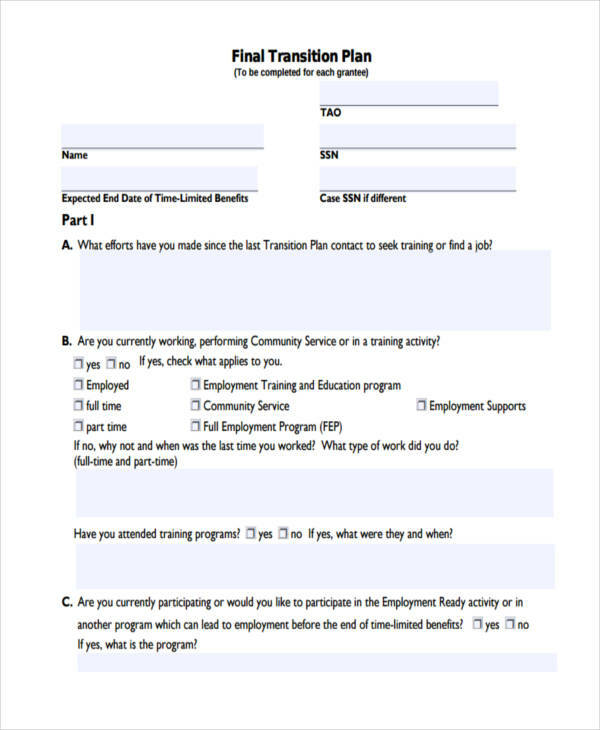 Transition Staff – Key personnel involved in the transition must be identified and briefed on the coming change. 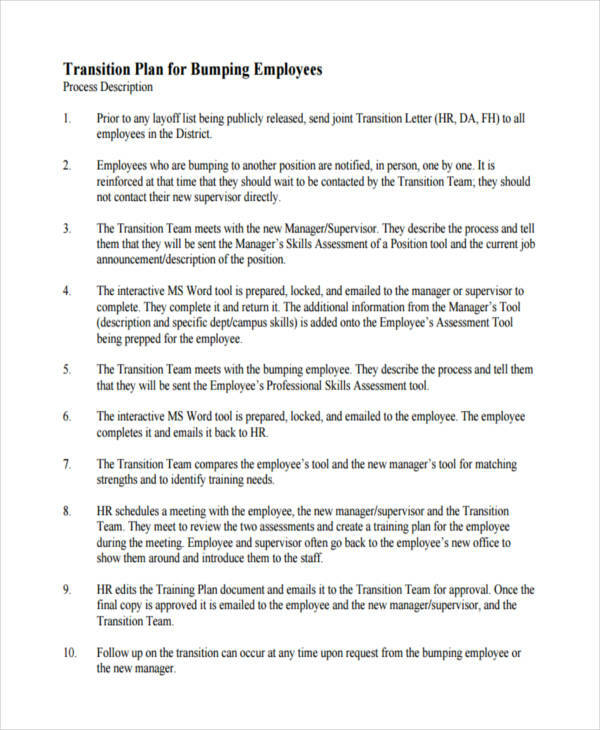 They must be able to convince the rest of the teams left for the transition can benefit in the transition. Knowledge Transfer – Having a new company or new system in effect would change the way things are done or how the company or business operates. The need to have the remaining teams prepared and trained in the new system has to be addressed. Logistics – Some mergers involve transfers from one location to another involving equipment among others. 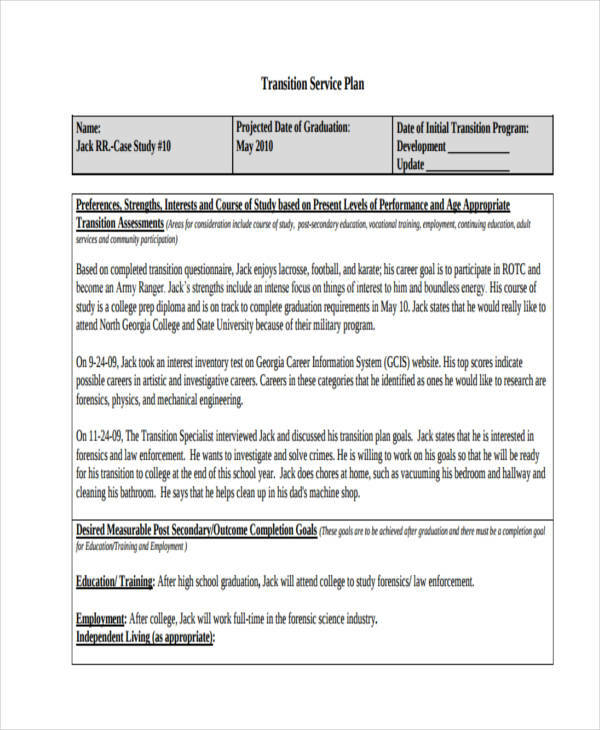 The schedule of transfer for these equipment has to be considered since some daily operations of a business plan may involve the use of such equipment. 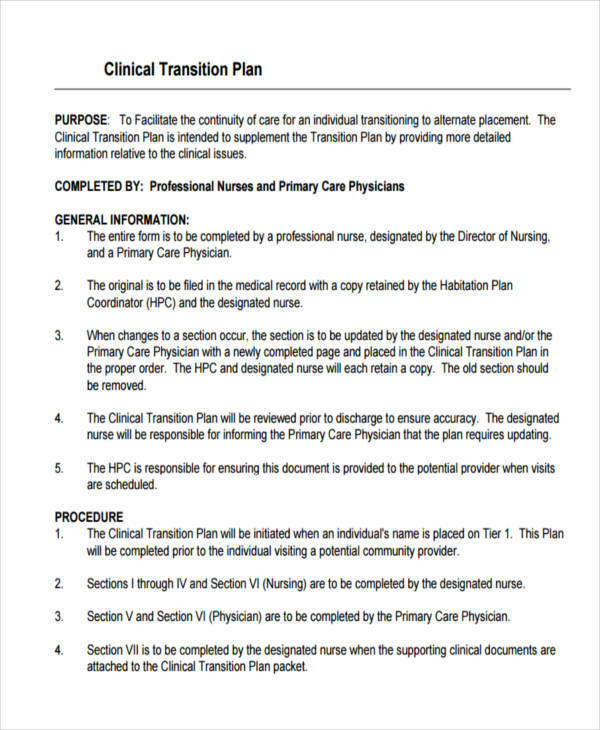 Schedule Details for Implementation – Depending on the complexity of the transition, the dates involved in the implementation of such transition may not altogether be at the same time. Some changes may require for some time to take effect while some may not.